No-one had heard of Mercia until Penda came to the throne. It is not quite clear exactly when he seized the throne from his cousin, King Ceorl of Mercia, but a date of around AD 626 is generally accepted. In his Historia Brittonum, Nennius writes that Penda quickly declared Mercia's independence from a Northumbrian overlordship. He certainly seems to have entered into a defensive pact with the joint-Kings of Wessex, Cynegils and Cwichelm, against the growing power of Northumbria; and it was sealed by the marriage of his sister to Cynegils' younger son, Cenwalh. However, when Cwichhelm went on the offensive, by trying to assassinate Edwin of Deira, Penda may have felt it best to annul the alliance. Indeed, after the Wessex armies were crushed by the vengeful Northumbrians, the Mercian King seized the advantage and invaded the kingdom of his one time allies. 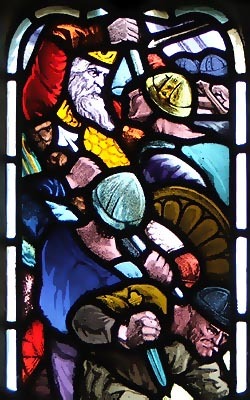 At the Battle of Cirencester in AD 628, Penda defeated the men of Wessex and took control of the territory of the Hwicce (roughly Gloucestershire). This area had nominally belonged to Wessex since AD 577 but consisted largely of a British population. And so began King Penda's infamous career of aggressive warfare on all frontiers. Tradition says that, around two years later, Penda had turned his attention to the Dumnonians of South-Western Britain, and it was at the Siege of Exeter that he encountered King Cadwallon of Gwynedd. Cadwallon had returned from a brief exile in Brittany, after being expelled by his sworn enemy, King Edwin of Northumbria. He raised the siege and the two parties then entered into peace negotiations which led to a great alliance between Mercia and Gwynedd. The twin-army regained Gwynedd at the Battle of the Long Mynd and then marched on Northumbria. Together the Mercians and the Welsh ransacked the North over a period of three years of campaigning. Eventually, at the Battle of Hatfield Chase, Edwin of Northumbria was killed and his kingdom brought the kingdom to its knees. For almost a year, Cadwallon of Gwynedd continued to ravage beleaguered Northumbria, although it is not clear what part the Mercian army played in the carnage. Nominal Northumbrian monarchs came and went until King Oswald finally crushed the Welsh at the Battle of Heavenfield, where Cadwallon was killed. Penda, meantime, was looking to his eastern borders where the old Mercian homeland had come under the rule of East Anglia. Determined to built on his triumphant Welsh alliance, the Mercian monarch invaded Middle Anglia in AD 635. He quickly conquered the country and killed Kings Sigebert and Egric in the process. Mercia was peaceful for the next seven years, but, in AD 642, the storm clouds gathered once more. It is not clear exactly why the armies of Northumbria began to move against Mercia, but the kingdom was clearly viewed as a major threat. King Oswald marched his warriors deep into the midlands and the old adversaries clashed at the Battle of Oswestry. It may be that Penda had withdrawn here to the western regions of his kingdom in order to allow himself time to rendezvous with his allies from across the border in Wales. Fortunately, Penda had powerful friends. Kings Cadafael Cadomedd of Gwynedd, Eluan of Powys and Cynddylan of Pengwern all joined the fray. Penda's brother, Prince Eowa (perhaps a sub-King in Wrocenset) was killed in the fighting, but so was Oswald. Penda's victory encouraged him, the following year, to seize control of both Elmet and Lindsey while Northumbria was still consolidating under a new monarch. Then, when his brother-in-law, now King Cenwalh of Wessex, renounced Penda's sister as his wife, the King of Mercia followed up with a move his southern kingdom in AD 645. Cenwalh was driven out to the sanctuary of East Anglia and Penda ruled Wessex for three years before his return. By AD 650, Penda decided it was time to teach King Anna of East Anglia not to interfere in his expansionist policies and his armies marched eastward. Anna fled to outer Powys, but Penda followed him, ousted the British from Caer-Magna (Kenchester) and settled the area as Magonset, with his son Merewalh installed as its first king. Meantime, King Oswiu of Northumbria was having a hard time establishing his authority throughout Northumbria and, with an aggressive Mercia on his southern border, he tried to placate Penda by establishing a marriage alliance between his eldest son, Alcfrith, and the King of Mercia's daughter, Cuneburga. It did not work and, in AD 652, Penda invaded Northumbria and besieged Oswiu in the far north of his kingdom, at Bamburgh. Further attacks followed when Oswiu's nephew, King Aethelwald of Deira called for Penda's assistance. Penda now felt so secure that he established another of his sons, Peada, as King of Middle Anglia. He then invaded East Anglia and killed its King, Anna. The latter's brother and successor, Aethelhere, subsequently found it prudent to submit to Mercian overlordship. With an expanded kingdom, Penda raised a vast Welsh and Middle Saxon army with which he planned to crush Northumbria once and for all. In AD 655, they marched north and ravaged Bernicia. Oswiu fled to his most northern city of Stirling and tried to bribe Penda into withdrawal. Penda took the cash but distributed it amongst his Welsh allies who considered it restitution of their own property since it had been taken from the British of Gododdin in the first place. The two armies eventually met at the Battle of Winwaed, where Penda and several of his Royal allies were killed. Penda remained a Pagan throughout his life but, by his wife, Cunewise, he fathered a large family who all became Christian: Peada, King of Middle Anglia; Wulfhere and Aethelred, eventually Kings of Mercia; Merewalh, King of Magonset; St. Cuneburga, wife of King Alcfrith of Deira and Abbess of Castor; St. Cuneswith; St. Cunethrith of Castor; St. Edith of Aylesbury; St. Edburga of Bicester; and Wilburga, wife of King Frithuwold of Surrey.